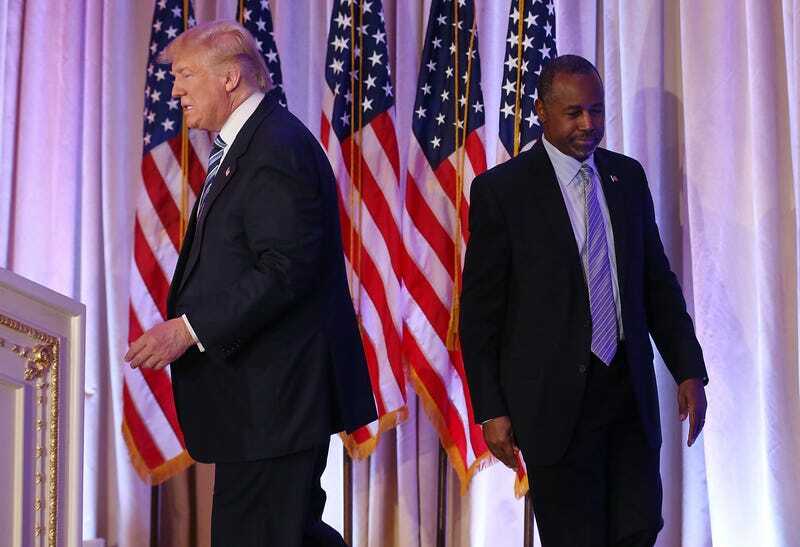 Then-Republican presidential candidate Donald Trump and former presidential candidate Ben Carson are seen as Trump receives Carson’s endorsement during a press conference March 11, 2016, in Palm Beach, Fla. There are many reasons not to serve in the Donald Trump administration. For starters, by the simple virtue of Tangerine Mussolini's being grossly unqualified for the presidency, who could blame anyone for not wanting to serve under what will likely prove to be a disastrous commander in chief? However, when it comes to the likes of Newt Gingrich, who had long been touted as a potential Cabinet holder, there are other factors at play. That sounds like Joanne the Scammer talk for, “I’m 73 and I want to spend my twilight years doing what I do best: giving speeches for large sums of money; being on TV all the time; fancying myself as a historian.” You know, anything but working for a volatile man with the ego of your garden-variety authoritarian leader in over his head. But there are other previously mentioned potential Cabinet members who are being far more forthright about why they will not be working with Tangerine Mussolini. For Ben Carson, a vice chairman of Trump’s transition team, it’s quite simple: He is unqualified. Carson’s business manager, Armstrong Williams, recently explained to Reuters, "Dr. Carson doesn't feel like that's the best way for him to serve the president-elect.” Instead, Carson will remain an adviser and friend. "His life has not prepared him to be a Cabinet secretary," Williams added. There is delicious irony in the fact that Carson, who sought the Republican nomination for president, has suddenly realized that he has no business being in a position of power in government. Not surprisingly, many have lashed out at Carson for running for president, only to later acknowledge that he is unqualified for a leadership role in the federal government. Now, there are a lot of things Ben Carson got wrong in his bid for the presidency. This time last year, Carson’s advisers publicly acknowledged that their candidate was struggling with foreign policy. Carson also displayed ignorance about the debt ceiling. As in, he had no idea what in the hell the debt ceiling was. Carson never appeared to know much about the government at all. Carson only appeared to be sure of issues like his belief that Joseph built the pyramids to store grain. Carson’s presidential bid ended with him managing to make “brain surgeon” a pejorative and, of course, boosting his public profile. The latter was the main reason he ran for president, though. As we’ve come to learn over time, the Republican presidential primary in the modern era has been a way for hucksters of Carson’s ilk to sell books, land radio and TV contracts, and boost speaking fees. They run for president, manage to do so-so in the polls in the early months and then go on to lose miserably while drowning their faux sorrows in an influx of cash. See Herman Cain, Mike Huckabee and other losers. These men and women are nothing more than the political equivalent of reality stars that go on to hawk Flat Tummy Tea on Instagram. For quite some time now, Tangerine Mussolini was believed to be on that same wave. An ex-Trump insider once claimed that he didn’t want to be president. As a result, we have now reports from the Wall Street Journal that claim President Barack Obama is so taken aback by Tangerine Mussolini’s lack of understanding of the scope and breadth of the presidency that he’s taking additional time to, more or less, help him learn how to be president. Does that sound like someone who really wanted to be president? No. In essence, Trump is Château Shereé before this season of The Real Housewives of Atlanta: a half-assed storyline that served the purpose of garnering attention. Ben Carson may be a lot of things—a fool, a charlatan and a waste of a political news headlines—but if nothing else, the man knows when to end the scam. Sadly, our president-elect is a stunt too far. Now we’ll all suffer as a result. It is a testament to the joke that is the contemporary GOP primary system, but hopefully, a lesson for the future. Well, whatever future this country has left.